You’ve reached Holly Enterprises, the professional flash repair experts. 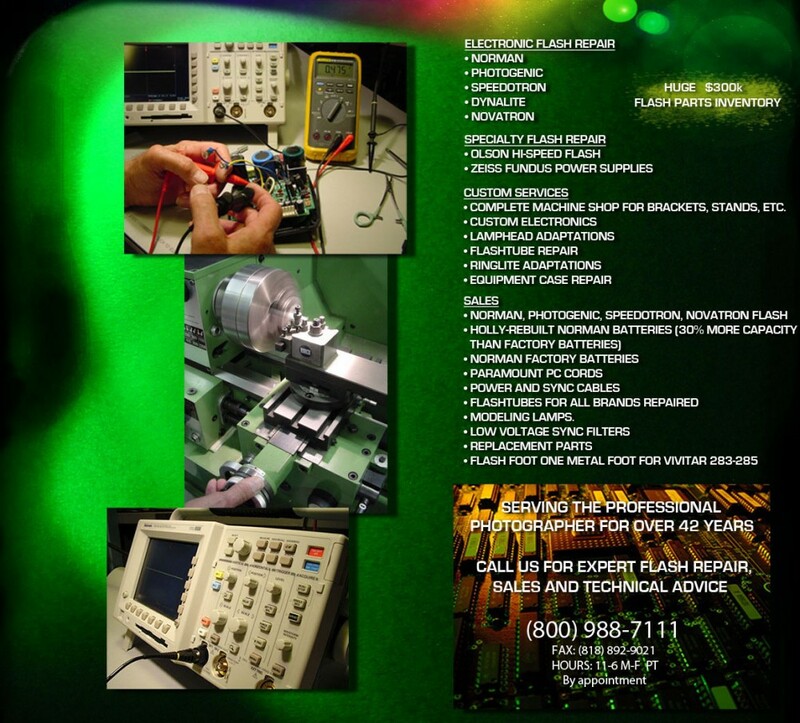 We’ve specialized in repairing large American-made pro studio flash and Norman battery portables since 1969. We are factory authorized, have a huge $300,000 parts inventory and have been under the same ownership and technical leadership for over 43 years. We have over 70 years in-house experience on many brands of flash equipment. If others tell you your old flash can’t be repaired or “we don’t support that”, see us. Our institutional knowledge of pro flash equipment is second to none. We repair units from the ’60s forward and receive factory referrals constantly for units they no longer repair. New or old, call us at: 800-988-7111. You will find us very easy to deal with and extremely helpful with technical, sales, and service advice. Don’t hesitate to call… it’s free! Any and all American-made flash questions addressed. You’ll always talk directly with an experienced technician… what a concept! You will probably find no company with more hands-on experience in large American flash than Holly Enterprises. It’s not a sideline or hobby with us… it’s our full time job. If you have tried other repair companies with marginal results, talk to the pros at Holly… you’ll be pleasantly surprised. We pride ourselves on good, old fashioned, personal service you thought disappeared years ago. Call us at 800-988-7111.